34 • Textile Insight ~ January/February 2018 textileinsight.com Going Under Baltimore-based Under Armour is looking to its new Hovr platform to help it make headway in the competitive running market. The material, an olefin-based polymer developed with Dow Chemical, is designed to give what Under Armour SVP of global footwear Topher Gaylord called a "zero-gravity feel." The material, the company said, has a super-springy feel with a lot of energy return — but still gives the wearer a cushioned feel underfoot. The material is used in a rim and core construction, and wrapped in the brand's Energy Web textile to direct energy return back to the wearer — or, as Gaylord put it in a presentation to retailers at The Running Event confer- ence and trade show, to "cage the animal." The technology debuts Feb. 1 in two models: the $120 Hovr Phantom and the $100 Hovr Sonic. Per chief design officer Dave Dombrow, the Hovr family of styles will expand, possibly into more athletic categories, for future seasons. And the two launch styles have one more key piece of technology underfoot: the shoes will both be offered with a Bluetooth-enabled sensor as part of the brand's Connected fitness platform. (Connected styles will retail for $10 more apiece than non-Connected models.) The improved passive sensor, which syncs automatically with the brand's new MapMyRun app (also launching Feb. 1), will track not only distance, but also cadence, stride length and splits. FOOTWEAR | FALL '18 OUTLOOK Footwear Gets Futuristic Compelling Material Breakthroughs for the Year to Come. 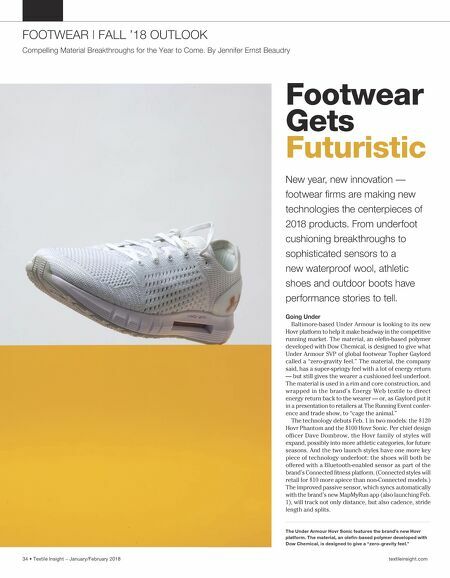 By Jennifer Ernst Beaudry New year, new innovation — footwear firms are making new technologies the centerpieces of 2018 products. From underfoot cushioning breakthroughs to sophisticated sensors to a new waterproof wool, athletic shoes and outdoor boots have performance stories to tell. The Under Armour Hovr Sonic features the brand's new Hovr platform. 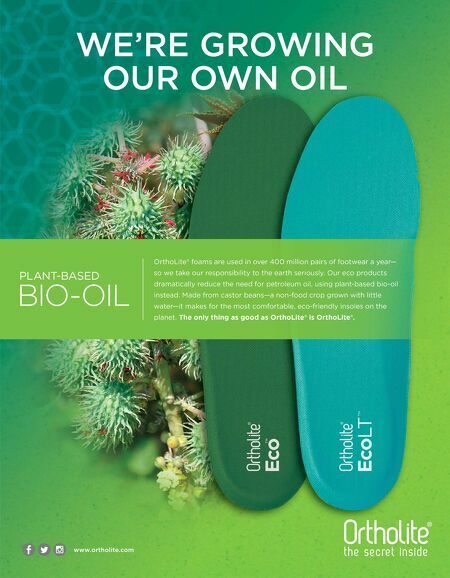 The material, an olefin-based polymer developed with Dow Chemical, is designed to give a "zero-gravity feel."